You’re interested in joining our sorority? We’d love to have you. You’re the type of person we look for: committed, enthusiastic, a leader. We think you’ll do great things here, and we hope that we’ll open some doors for you. You will make lifelong friendships, and hopefully, you’ll be the type of person whose positive impact will be felt here for many years. This is the start of something really cool. We know you have your reasons for joining, and we also know that the reasons you’ll stay will be entirely different. Trust us on that one. People tend to join for the image, the props, and the social stuff. They stay around for the friendships and because they find a place where they can impact the lives of others. It’s a family. We know this. Soon, you will, too. It’s the one most important thing that any fraternity or sorority can impress upon its new members. It’s the one lesson that every group must impress upon its newest members. Truly, our survival as an organization on this campus, and nationwide, depends on you understanding this one simple lesson and taking it to heart. It’s more important than our history, our traditions, our structure, or our rules. Because, if you don’t understand this most fundamental lesson, then none of the other stuff will matter. If you don’t get this one “golden rule of fraternity,” then your son or daughter won’t have this kind of organization to join someday, and all of this will just be a fuzzy memory. 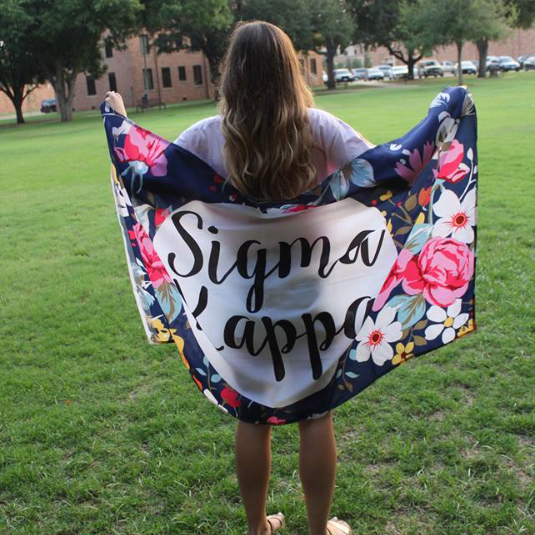 From the moment you say yes to this organization, you are always wearing your letters. I’m going to repeat it. We’re not talking about t-shirts, or sweatshirts, or hats made in the colors of the group. We’re not talking about a tattoo on your ankle, some party favor, or a badge you wear on your dress shirt. What we mean is that when you say yes to lifetime membership in this group, everything you say, do and represent from that moment forward is a direct reflection on this group, your sisters, and the thousands of members who have come before you. Everything you put out to the world is a direct reflection of this fraternity. Every decision, every achievement, every mistake you make happens to all of us from this point forward. When you go to the grocery store, you represent us. If you fall asleep in class or earn a weak grade, you represent us. When you drive down the road and slow down so a pedestrian can cross the street, you represent us. When you turn 21 and hit the town, you represent us. When you become a leader of another campus organization, you represent us. When you insult someone or talk badly about another sorority, you represent us. When you break up with someone and make decisions about how you behave during that difficult time, you represent us. When you go on Spring Break, you represent us. When you go home and sit at your mother’s dining room table, you represent us. When you get a job and go to work for a company or organization, you represent us. When you commit your life to that special person, someday, you represent us. You are always wearing your letters. From this day forward, always. Every day, in every situation. They never come off. As surely as if you tattooed these letters on your forehead. It doesn’t matter if you’re wearing a jersey with our name on it, or a business suit at an interview. You have to assume that every person you meet will form a permanent opinion about sororities – good or bad – based on how you interact with them. Every good thing you do builds us up. Every dumb thing you do tears us down. We live in a time when the actions of one man or one woman can kill a group like ours. One person who acts in a way that is inconsistent with our shared values can end a hundred years of tradition and pride. One choice you make on a Friday night can take away everything that generations of women have worked to build. All the stuff you see that belongs to us can be boxed up or thrown out, because of the choices you make. If this seems a little intense, that’s good. Because it’s serious. If it sounds like too much responsibility, or if you don’t think you can behave in a way that reflects well on us at all times, then walk away now. Do us the favor. We won’t think less of you. In fact, we’ll thank you. This sort of commitment isn’t for everybody. But, don’t say yes unless you understand. We’re not asking you to give up anything. We aren’t asking you to become something you aren’t. We’re asking you to become something more. We’re inviting you to become part of a group of women who make a promise to take care of each other, every day. We’re asking you to become the very best version of you that you can be. We’re asking you to take a leap of maturity and to go to that place where you’re the same, honorable, dignified person on Saturday night as you are on Tuesday morning. It’s a big deal, and not everyone can do it. Forget everything you’ve heard up to this point. Forget how much you might desire this, or how much we might want to bring you into the group. Just clear your mind and ask yourself one question. Are you ready to never take them off? Because when you say yes, you’re not just putting letters on a sweatshirt. You’re putting them in your heart. You’re forever stamping your identity with them. Everything you are, from this point on, becomes who we are. You will make mistakes, and your sisters will remind you of your commitment. There will be times where you will see other sisters forgetting their promise, and you’ll need to remind them. That’s part of this whole “sorority” thing. We work together to make ourselves better women who stand for something. We carry each other. We matter to one another. If we’re doing sorority right, then we’ll make you a better woman. If you’re doing everything right, then you will make us a better organization. So, please think about it. Take it seriously. Because if you say yes, these letters belong to you as surely as they belonged to our founders. If you say yes, these letters become your responsibility forever.